The Church of Scotland seeks to ensure that the Church is a safe, responsible and caring environment for all. To achieve that, rules and procedures have been put in place to enable the Church to deal with any acts of inappropriate or unethical behaviour by any Church minister, deacon or office bearer. These rules differentiate between serious issues of conduct, and other acts of inappropriate behaviour. For serious issues, the Church has internal disciplinary procedures. In some circumstances, it may be appropriate to refer the matter to the Police, if the complainer has not already done so. For less serious matters, the Church has a Complaints Procedure. The aim of this Procedure is neither to trivialise serious matters nor on the other hand to treat minor matters with undue seriousness. In this Procedure, the Church wishes to prioritise the use of mediation and conciliation, as experience suggests that this is the best way to ensure an outcome where everyone involved feels that their concerns have been appropriately discussed and dealt with. In framing its Complaints Procedure, the Church has been strongly of the belief that a person with a legitimate grievance must be listened to and their complaint should be properly and fairly addressed. Please note that the information which follows is for guidance only, and is not a substitute for the detailed law which appears in the Acts and Regulations of the General Assembly. These Acts and Regulations are available in Church Law. 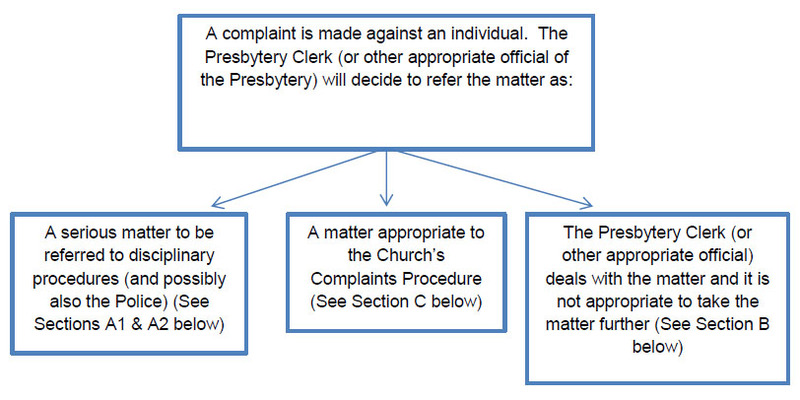 If you have a complaint to make against a minister, deacon or office bearer of the Church, then there are various ways in which the Church may determine that should be addressed, as illustrated in the flowchart below. If the allegation is a serious one, it will immediately be referred to be investigated in terms of the Church's internal disciplinary procedures. If you are the person who made the complaint, you will be given information about the process which will be followed. This will differ depending upon whether the allegations are against a minister or deacon, or against an office bearer. The procedure may also differ depending on the nature of the allegations, for example if there are issues of bullying or discrimination and depending upon whether the person is an employee of a local or central agency of the Church. If the matter is dealt with under disciplinary procedures, then you may need specialised advice. This may be available from the Presbytery Clerk, or the Principal Clerk. Further details will be provided on an ongoing basis in this situation. Disciplinary proceedings may ultimately lead to a censure being imposed on the respondent (ie the person who is the subject of the complaint). In the case of a minister or deacon, this may consist of a reprimand, suspension for a fixed period or without limit of time, or removal of status as a minister or deacon. In the case of an office bearer, the Presbytery may decide to give an instruction regarding future conduct, issue a reprimand, remove the person from office or deprive them of status. In some circumstances, it may be appropriate to refer the matter to the Police, if the complainer has not already done so. This will be where criminal behaviour is alleged, in particular where there are allegations of a serious sexual nature, where vulnerable groups are involved or where allegedly there has been financial impropriety. Anyone who becomes aware of offending of this nature is urged to contact the Police immediately. Whether or not a minister, deacon or officer bearer of the Church is found guilty in a civil or criminal court of law, they may still be proceeded against under Church law. Where an investigation has already commenced under Church law but it then becomes apparent that the Police are involved, it would be normal for any internal Church investigation to be suspended until a Police investigation has been completed. In some cases it might be determined at an early stage that the allegations do not require further consideration or investigation. A conversation with the Presbytery Clerk or other Presbytery official may well have been enough to allay your concerns or to establish that the matter does not require further investigation. However, normally the matter will be referred to the Church's Complaints Procedure. A matter which does not justify being referred to disciplinary procedures nor to the Police, and which has not been resolved at an early stage, will be referred to the Church's Complaints Procedure. Further information can be found on the what is and what is not a complaint page. You can access information about making a complaint on the making a complaint page. What is and what is not a complaint?